Unlock a lifetime of savings for the future of you and your family. Rather than taking your tax return and spending it on the newest smartphone or tech gadget that you probably don’t really need why not invest it back into your home? Well, how old is your home? Have you been in the attic lately? Do you know what kind of insulation is up there? Here’s the thing: your attic is on top of your house and heat rises. When you consider that batt insulation loses half it’s effectiveness at, or below -20Cº and the fact that batt insulation loses R value as time goes on, we think it’s worth getting a free professional opinion. By investing in your home your monthly bills will be reduced (cut in half), and you can do whatever you want your savings, your potential government rebates and your future tax returns. Plus you can take pride in knowing that 2019 was the year that you started saving your money and did your little part to help the planet. Reduce stress, knowing your biggest investment (your house) is condensation free. Save money every month on your utility costs, forever. 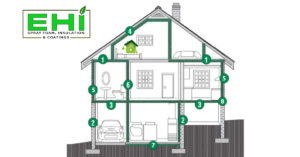 Use less natural gas to heat your home. Keep more heat inside your home, extending the life of your furnace. Hiring a locally owned company who supports the community and is more passionate about Spray Foam and Insulation Solutions than you’d believe. Receive up to $3500 in government funding to subsidize the cost of your improvements. Your house will stay cooler in the summer. Your friends will think you’ve ‘grown up’ because you’re making smart decisions with your money, for a better future for yourself and everybody else on this earth. We can answer any of your questions and upon request, send an estimator to take photos of your insulation situation to properly quote the cost of improvements you’ll need for the best value. From there, we’ll navigate the AB Government bureaucracy to provide you with an estimate of the value of rebate you may qualify for. So it’s up to you to decide: Smart phone or smart home?